Taking a trip on the new Welsh Highland Railway has to be one of the most spectacular ways to see the awe-inspiring scenery of the Snowdonia National Park. 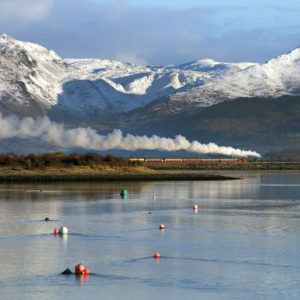 The Welsh Highland Railway is train travel as it used to be. Starting from beneath the castle walls in historic Caernarfon, the railway climbs to the foot of Snowdon before dropping again to sea level at the harbour in Porthmadog. The original railway closed in 1936 and has now been completely rebuilt by volunteers at a cost of £28 million. 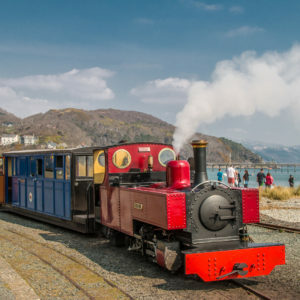 With the 25-mile line now complete, together with a new £1.25 million two-platform layout at Harbour Station at Porthmadog (complete with a substantial semaphore signalling installation), it is now possible to connect with the world-famous Ffestiniog Railway and experience 40 unbroken miles of spectacular narrow-gauge steam. The trip though the Aberglaslyn Pass voted the most beautiful place in the UK by members of the National Trust is nothing short of magical and the views of Snowdonia from the wide flatlands of the Traeth Mawr reclaimed from the sea with the building of William Madocks' mile-long Cob embankment 200 years-ago are simply stunning. The railway offers a variety of other fantastic trips the line allows passengers to gain easy access to some of the most popular walks up Snowdon, such as the Snowdon Ranger from Rhyd Ddu and paths up Mynydd Mawr or the Nantlle Ridge. Sitting in the comfort of one of the first-class Pullman carriages is surely one of the finest experiences in North Wales, as is the excitement of riding in one of the open carriages behind the world's most powerful narrow-gauge steam locomotives, the Beyer Garratt NG/G16. Weighing in at over 60 tons, these magnificent locos are more powerful than many standard-gauge steam engines and the sound of them working hard up the toughest railway in the UK is an experience to be savoured by any steam enthusiast a solid six miles of 1 in 40 gradient is as tough as it gets. The railway also has stations at Beddgelert a magical centre of Welsh culture and Pont Croesor, right alongside the RSPB's Glaslyn Osprey Centre, before running through the streets of Porthmadog to connect up with the Ffestiniog Railway, the oldest independent railway company in the world, founded by Act of Parliament in 1832. 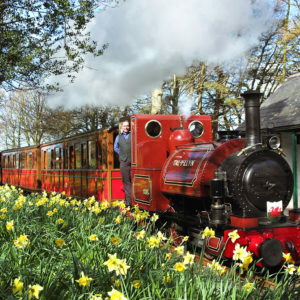 The area is renowned for a selection of excellent real-ale pubs, such as those found at Waunfawr and Rhyd Ddu, and the Lôn Eifon cycleway runs alongside the line from Caernarfon to Dinas, with special wagons available to transport bikes. Today the thousands of tons of slate have been replaced by thousands of tourists who now enjoy the outstanding natural beauty of Snowdonia as they pass through areas untouched by roads and undisturbed by the sights and sounds of modern life. Caernarfon: The nearest mainline station is Bangor. A bus service runs to Caernarfon and Porthmadog. It is served by Traws Cymru T2, a direct service between the University towns of Bangor and Aberystwyth seven days per week, stopping at Caernarfon and Porthmadog. Arriva buses and Lloyd's Coaches also provide a bus service. Caernarfon: There is a small car park next to Gwynedd Tyres, while the large Slate Quay carpark is just a few minutes' walk away close to the castle. Porthmadog: Parking is available in Porthmadog Harbour Station (LL49 9NF) £2.00 all day car park. If it is full you will be directed to the overflow car park, £2.00 all day. There are no parking facilities at other stations, but nearby public parking is available.